Memory Lane Friday is a weekly blog carnival where you can link up with your memories. All are welcome. This week's theme is Earth Day. While that might seem like a challenging topic, it really isn't. You could blog about a nature hike you took, a craft you made using recycled items, a pet frog - anything that celebrates the earth! Earth Day just happens to be one of my favorite holidays. I love that it embraces the earth and doesn't involve candy or presents. My sophomore year of high school I was tormented by a little subject called CHEMISTRY. Oh how I suffered through that class. In the spring, when Ms. Bohince gave us an optional extra credit project, I was all over it. I needed all the help I could get. The challenge was to create a costume out of recycled items for Earth Day. 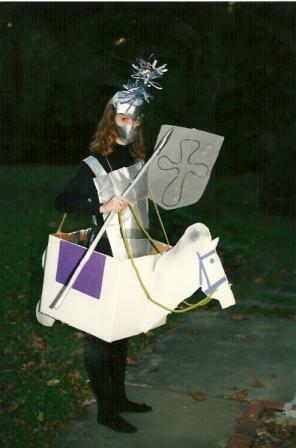 A knight costume! Not so bad, eh? I did get my full extra credit, and I think I managed to pull a B in the class when it was all said and done. Be sure to visit other blogs and leave a comment. Next week is a 'no theme' week. Have you entered my GIVEAWAY yet? It ends tomorrow! Aw, man . . . chemistry tormented me, too! That was my hardest class, ever, in high school. I love the costume! How creative! I loved chemistry although I couldn't tell you any of the symbols on that crazy chart anymore. What a wonderful outfit! I hate light the burner to do the experiments! Thankfully my lab partner loved to. How cute! I have forgotten my chemistry grade - probably for the best. I somehow managed to graduate from high school without having to take the dreaded chemistry class. Brilliant! You look FIERCE! My sons make castles out of old boxes and egg cartons and bottles and yarn. They're of that Renaissance ilk. Great job on your costume! It was worth every extra credit point. I linked up with Family Farm Memories. Thanks so much for hosting! I love your costume picture but I don't want to remember how HORRIBLE I did in Chemistry. Earth Day is a great day to celebrate family farmers who care for our land and grow safe and healthy food which is why I featured farm memories today. oh my gosh, i had a hard time linking up and i coudn't do it with my own logo... but i did it... YEAH!!! Thank you so much for hosting and i linked up with the memories of me and my husband's love story! This is very clever, and I love the horse! Perfect for Earth Day! I loved Chemistry! My high school was college prep and I took 4 years of chemistry. In my Chemistry 101 course in college we used the same text book I had used my senior year of high school, made for an easy A. I love the costume. You were creative even back then it seems. Oh GOOD KNIGHT - I hope you got an A! Why, oh why, couldn't my chemistry teacher offered extra credit projects like that? All I remember is having to memorize the periodic chart!